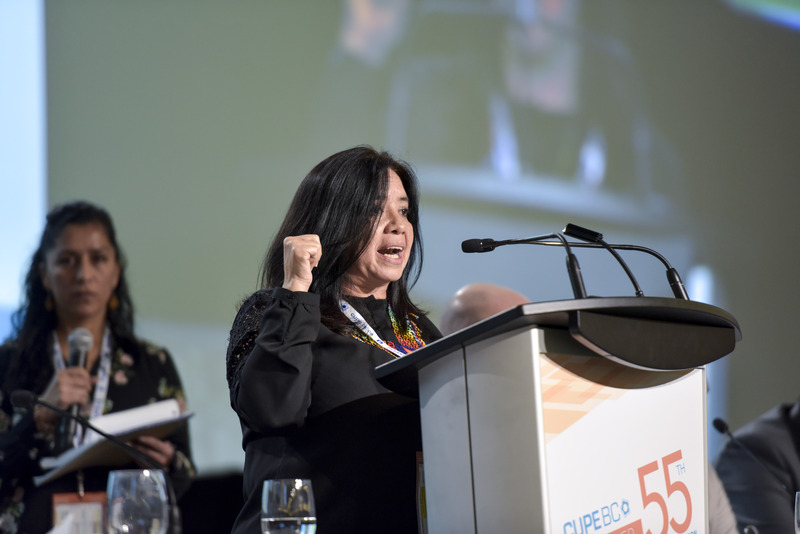 Berenice Celeita, leader of CUPE’s partner in Colombia, NOMADESC (Association for Research and Social Action), attended the CUPE BC convention in April 2018. She sat down for an interview with CUPE just months before the right-wing government of President Ivan Duque Marquez was elected to power. The situation facing social movement activists was dire at the time. The election of Duque makes the situation worse – and the need for solidarity even more urgent. This is a transcript of the conversation between Berenice and CUPE communications representative Dan Gawthrop. Steve Stewart of CoDevelopment Canada provided simultaneous translation. It has been edited for clarity and length. For a condensed version of the intervew, click here. 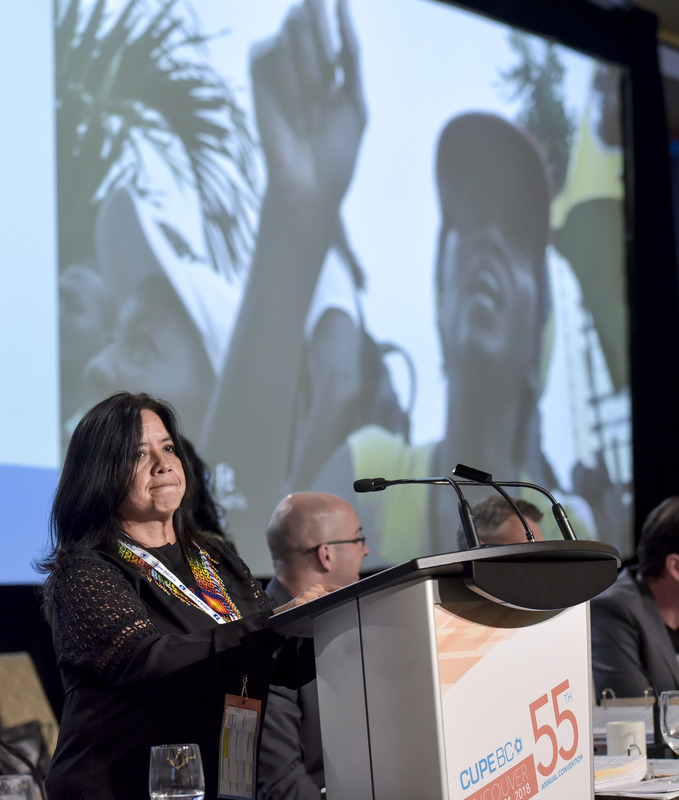 DG: For Canadian union activists, one of the most alarming stories coming out of Colombia has been the targeting of trade union leaders for assassination. Has the situation changed at all in the past couple of years? BC: No, unfortunately – though the targets have changed to an extent. Before it was trade union leaders, then journalists. Now it’s community leaders protecting territories. Since December 2016, when the peace accords were signed, 285 community leaders and human rights activists have been assassinated. And this figure doesn’t account for most cases where people are afraid to report the killing. BC: The economic model on which the government is basing its development and its agreements with international forces, which is incompatible with the development models of the campesino, Indigenous and Afro-Colombian communities. The shift to targeting activists protecting their territories is linked to the conflict with transnationals coming in and wanting to operate in those territories. Between 2010 and now, the Colombian government signed 17 free trade agreements. The first one was with Canada [under former president Álvaro Uribe Vélez]. DG: According to Human Rights Watch, more than 6.8 million Colombians have been displaced in the last 20 years, a figure second only to Syria in the last seven years. BC: Those figures come from a study done by the Truth Commission in Colombia. They think it underestimates the number of people who have been displaced. Ten million hectares of land have been taken from that rural population. They’ve been driven off. It is an achievement that the commission has those figures. Those numbers were presented to the Truth Commission in 2016 during the peace talks, and the government recognized that figure. Before that, the government had always denied that this many had been displaced. The fact the government has acknowledged those numbers, as well as the numbers around assassinated people, doesn’t mean the government has done an about-face. Rather, they chose that moment because during the peace negotiations there was talk of having a transitional justice system to process actors in the conflict that had committed abuses. If the military people that assassinated people, that drove them off their land, admit it now, they could be absolved through this process. That’s why they chose this time to acknowledge and accept those figures. DG: What’s their reasoning? It seems bizarre that they can attempt to absolve these military officials for such abuses just by admitting them. BC: The justice process that came out of the peace talks is called the Comprehensive System for Truth, Justice, Reparation and Guarantees of Non-Repetition. It has three aspects. One is the Special Jurisdiction for Peace [a tribunal focused on prosecuting human rights abuses]. Then there’s the Search Commission for Disappeared People. And then there’s the Truth Commission. The Truth Commission’s job is to report on all the cases that happened. So they register when something happened, who did it, whom they did it to, when they did it and why. But for what comes out in testimonies during the process of the truth commission, part of the agreement is that this evidence cannot be used then in trials or civil litigation. The Special Jurisdiction for Peace rewards people who share the truth, basically. For example, if I’m a military officer who has committed crimes and I come forward and say ‘Yes, we committed a massacre, we did this crime,’ it might be something for which, in a regular justice system, you would get 30 years in prison. [But] because you offered up the information, they lower the sentence to maybe one or two years. [On one hand] the government says to the victims of the violence: ‘Here we have a system to judge the crimes, you’ll get your justice.’ But part of the justice process is really to absolve or give very minor penalties to those who committed the crimes. DG: I’m presuming that the paramilitaries and security forces operate the same way they always have, correct? BC: More strongly, yes. What’s missing is a system to ensure these crimes aren’t repeated. That the movement for victims of state violence has a process to ensure that these human rights violations are not repeated. That truth comes out and justice is served, and that there are wholistic reparations to repair the damage that was done. And that’s precisely what’s not happening. There’s more of an effort to cover up crimes committed by the state and the perpetrators within the state. This impunity enables those perpetrators to continue committing crimes with the confidence that they’re not going to be brought to justice. So, what they have achieved is the first step: the truth. The government used to always say that human rights activists and trade union leaders were lying. Now what the government is basically saying is ‘Okay, the truth has come out, we recognize this, now we need forgiveness and to forget.’ And so the steps of justice and reparations are missing. DG: It must be a massive job, investigating all these crimes and getting them on the record. The fact that the government can get away with this approach up to now suggests that there isn’t a lot of external pressure on them to get some justice, some reparation that’s got some teeth to it. DG: Where do most people who are displaced end up? Where do they go? They’re not going to other countries, so they’re presumably still in Colombia, right? Is this mostly people from rural areas where the land has been taken away, and they are just going to the cities? BC: Yes. Twenty years ago, 70 per cent of the population lived in the countryside and 30 per cent was urban. So, in just 20 years it’s gone the other way: some 75 per cent of the population is now urban, and 25 per cent is rural. That may be a result of displacement, but the problem is bigger now. They’re looking at a second phase of displacement now: the people who were first displaced from the countryside in the 80s, 90s and the first decade of this century gathered in shanties around the cities. But as the cities grow, they are now being driven off those lands. It wasn’t enough for Big Capital to have the rural lands, now that’s valuable property on which they want to do urban development. DG: So where do the displaced people go? BC: That’s the problem: most of them end up becoming homeless people. Initially they would be small farmers, fairly poor but able to produce their own food, have food sovereignty and be able to choose what food they eat to survive. But then they were driven off the land and moved into the shantytowns and became labourers in the informal sector, street sales people and things like that. Now that they’re being driven out of the shantytowns, people are moving into the streets and into the areas where there are large populations of homeless people. Riot police are being mobilized to displace people who were already displaced from the countryside. In this new phase of evictions, people are being driven from one province to another, and also right out of the country. People in the community of El Jarillon, Rio Cauca, even though they were living in an urban area, still carried out agriculture living on the shores of the river. Some were producing vegetables in their homes, but a project that was partly financed by the Dutch to dredge the river to make it navigable, knocked down the houses in that neighbourhood. Before, capital left the crumbs for the population. But now they’re even gathering up the crumbs, too, so not even the crumbs are left for the population. It’s a stage where Big Capital seems to be trying to dominate even the most remote corners of life in Colombia and have control over everything. It’s an octopus with many tentacles, and we’re feeling it a lot, for example in increasing crime, street robberies, lack of security. It’s not justified, but people are desperate. If you’ve nothing to eat, that’s what you do. DG: How dirty are Canada’s fingers in some of this activity? Our government, through trade deals, and our corporations though industrial activity? BC: Canadian capital has been expanding in Colombia since the trade agreement, obviously the largest area is in mining, but they’ve also been investing a lot in privatizing public services. For example, water services holding companies are buying up things like dams or mining concessions. They have capital from Canada but also from many other countries, and they are put on the stock exchanges. When we were in Ottawa and had a meeting with government representatives, we said ‘You guys really need to know what you’re promoting the investment in, because the way you’re doing it right now it’s like you’re showing up at a party and you don’t know whose house it is, who the guests are, or what’s going on inside the house, you’re just coming for the party.’ We demonstrated to them that the cases of femicide, of displacement, of assassination were happening in the zones where the Canadian mining companies were operating. This doesn’t necessarily mean that they’re ordering the killings or that they’re directly involved, but if they’re operating in the areas where the violence is happening and they’re saying nothing, well, they’re covering it up. It seems to be connected: the increasing Canadian investment in the Colombian countryside seems to coincide with a reduced interest on the part of the Canadian diplomatic corps in Colombia to go and see what’s happening in the countryside. They sometimes used to send missions when there were violations, or to investigate, but for the last 12 years or so Canadian diplomatic corps hasn’t seemed interested in the human rights aspect. And we don’t trust the trend of ‘corporate social responsibility.’ Our experience in the communities has been that often it’s more window dressing, that it makes them look good and that they’re caring, but they continue to do the same things as they always did. Giving the impression that they’re monitoring the human rights situation, when they’re not, actually. For example, the Vancouver-registered oil pipeline company Pacific Rubiales invested a huge amount in a corporate social responsibility campaign in Colombia that was mainly public relations. Like, ‘If you want your child to have an education, come join Pacific Rubiales…’. It was more about changing their image than changing their actions. And then they changed their name because [the public relations campaign] didn’t work – because they were involved in these violent conflicts. It’s a practice that’s not uncommon with transnationals that operate in Colombia. They’ll get involved in conflicts and they’ll change their names. Then sometimes they’ll register themselves on a different stock market. They’ll go from Toronto to London. DG: It seems a never-ending struggle, what our corporations are doing there. I remember when Barbara Wood, acting on CoDev’s behalf before the trade agreement was signed with Uribe, was speaking to a panel that included Scott Brison, the then-Liberal opposition trade critic who helped broke the deal. He responded with real contempt and was willing to publicly berate Barbara for her criticism of Colombia’s human rights record. But it’s one thing for Canadian allies to be dressed down in public by our own politicians. What Colombian activists face involves real risk with far graver consequences. You’ve talked about the number of people who’ve been assassinated, and that nowadays it’s more community activists. But union activists are still at serious risk as well, right? BC: Yes, there are threats that continue. In Cali, in the western region, about every six or eight months, a threat gets issued that usually has a list of people that includes union leaders, people from NOMADESC saying ‘We’re watching what you’re doing, if you keep this up we’re going to get you.’ And they’re almost put out as reminders to labour activists and human rights people to not step too far out of line. DG: And you’ve been on that list for quite a long time. BC: Buenaventura is the principal economic port in Colombia, which is not that far from Cali, about two hours. And there’s been a lot of repression and instability there. NOMADESC is working there now, doing human rights workshops, community organizing. In May last year, there was a three-week general strike that shut down the port. NOMADESC has been working with the commission of follow-up, because the government had to sit down and negotiate with the strikers and made a series of commitments. Because they’re involved with that, the levels of threat [against NOMADESC] are starting to increase again, because of this work with the people of Buenaventura. The general strike was led by a community worker civic strike council, and one of the most prominent members of that council, Temistocles Machado – he was part of the committee that negotiated with the government – was assassinated on January 27. He was really a prominent activist in Buenaventura and really loved by the community and NOMADESC. They worked very closely with him. And since his assassination, there have been ongoing threats and intimidation against the civic general strike committee. DG: And I imagine that NOMADESC, in terms of your activist ranks, must see a lot of turnover. Do you get new activists coming in? What I’m getting at here is, is there a sense of sharing responsibility so that it makes it harder for the assassins to identify who to target? Or is the violence scaring people off? BC: Really, it’s kind of heartening that, despite the increase in violence against defenders of community territories, people have become more rebellious in Colombia. Despite this fear of violence they are taking to the streets and protesting, they are organizing, and when they do that they seek out NOMADESC for advice and training. Of course, to be active and remain alive, you do have to take a lot of personal precautions. In my case I didn’t accept protection from the government. I could have had a bulletproof car and armed body guards, but I didn’t want that sort of protection from the state. It’s not necessarily about being co-opted – a lot of people have accepted that protection, and I respect that – but the problem is, particularly in my work where I’m having meetings in vulnerable communities, that with the bodyguards come the eyes of the government. DG: Right, and that becomes another form of intimidation. BC: It’s not only me who becomes exposed, but also everyone I meet with. So I have my own methods of security. For example, I don’t sleep in the same place for more than one or two nights, I move around. I also never talk by phone about where I’m going, I change my routine on a regular basis, and so I am unpredictable. DG: Does an activist ever retire? BC: NOMADESC runs what we call the Intercultural University of the People, a three-year program that trains human rights activists and researchers coming from the communities and the organizations that they work with. The first three-year group graduated in December. The next day, one of the students of the 50 who graduated was killed. So she was assassinated, and then a month later Don Temis (Machado) was assassinated. When things like that happen, you don’t necessarily feel that you need to retire, but you do feel impotent. But I never really feel like it’s all for nothing. With the general strike in Buenaventura, just the very fact that 250,000 people took to the streets for 22 days and held them, despite all the repression, even if it forced the government to negotiate a solution, even if the government ends up not complying with the things that it signed off on, it’s still a victory because the people saw that they could hold the city for that long and that the streets were not just for capital. That when they took the streets, the kids started playing in the streets. And where before only big trucks passed by, that these became public spaces. And so even if they don’t end up having those victories complied with, it’s a victory. But with the murder of Vivian, one of the students, with the murder of Don Temis, you get frustrated, and you feel that, at the national level, no matter what you do it seems impossible to install a government that will respect rights. That feeling that you’re hitting against the wall is what is overwhelming. But to answer your question, I feel that a human rights defender, a community leader, a social justice activist never retires. Because, as Eduardo Galeano said, “What use is utopia? You advance two steps towards it, it moves away ten steps. You move ten steps, it moves away again. So what use is it? To advance, to move forward.” But the struggle is really for dignity, for the people to have the right to exist, to not be eliminated. DG: Do you have any message for NOMADESC’s Canadian allies, particularly in the labour movement, right now? BC: Yes. Through the support that CoDev receives from CUPE and the BC Government and Service Employees’ Union and other Canadian unions, there are specific areas where we’ve been able to advance. One is in education and research, where we’re providing training through the university to activists from marginalized communities to become researchers and develop the information that they need to be able to take strategic legal action. And then they’ve also been able to develop a community communications infrastructure that enables them to transmit the information that is generated. And finally, we’ve supported the empowerment of community organizations so that they can have processes to make decisions and articulate their demands to the state. 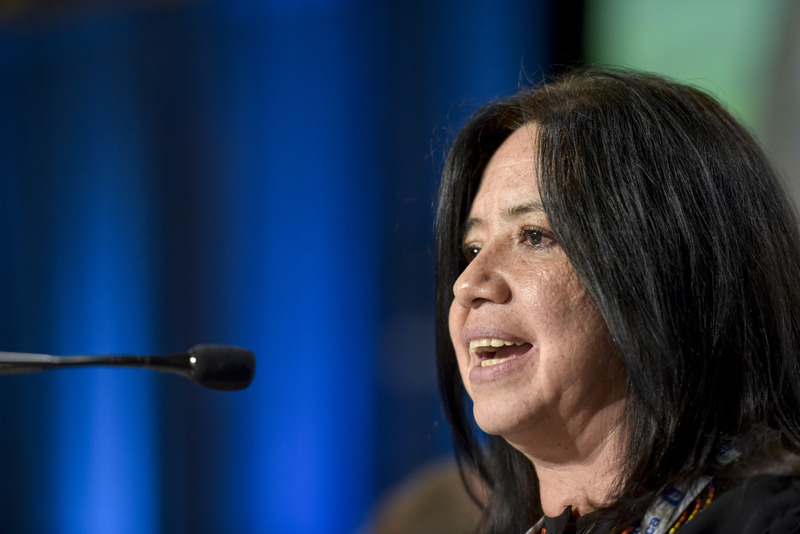 DG: What can CUPE and activists in the north do at the moment? BC: For Colombia, it’s very important to make visible at the international level what is going on since the peace agreement was signed, and to insist to the government that communities and social organizations be incorporated into the peace process. We need activists to insist with the Colombian government and the Canadian government and Canadian corporations that the concept of free, prior and informed consent be respected when engaging in territories that will affect communities’ livelihoods. And to be conscious of these questions when electing governments here in Canada. That just as we need to work more on that in Colombia, many times people don’t think of the international impact when they elect governments that are neoliberal or that are willing to carry forward the extractivist model. We also need to continue to support the work of training youth and community activists to carry out research and do community organizing. And it’s also very important to keep sending labour delegations to Colombia to visit us and see with your own eyes what is happening. I am convinced that I am alive today because of the actions of solidarity – whether it’s the letter writing and support from Canadian unions, or the accompaniment that we get by the peace brigades that come to support us. Without those I would not be alive, and there’s a kind of preventative solidarity that can take place – having that presence keeps bad things from happening – but also a transformative solidarity from being there, when people come to Colombia.